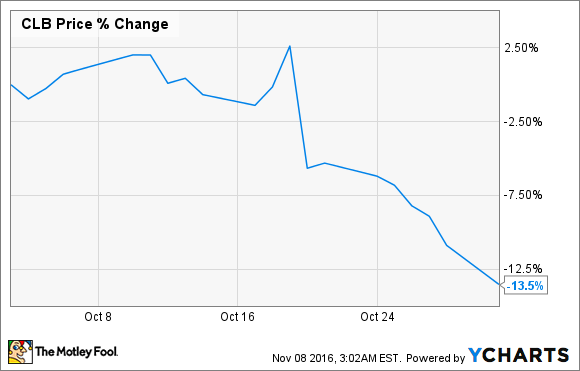 Shares of Core Laboratories (NYSE:CLB) declined 13.5% in October. The big catalyst for that slide was when the company reported earnings on Oct. 21st that showed the long anticipated recovery in oil and gas drilling activity has not yet come to pass. For a year and a half, Core's management has been saying that it foresees a rapid recovery in the oil and gas industry, or as CEO Dave Demshur puts it, a "V-shaped" recovery. That recovery didn't come this quarter as Core's net income result of $0.38 per share fell below management's guidance of $0.39-$0.41 per share. What also had investors disappointed was management's guidance called for the next quarter to be flat as well. The thing that still gives Core lots of promise is that even though revenue has fallen so quickly, it still is generating a solid EBIT margin of 14% and its free cash flow is still well above its net income results that allows it to keep a very tidy balance sheet and has allowed the company to maintain its dividend payments throughout this downturn. It also helps that the company has a very capital light business that allows it to ramp down or up spending quickly when necessary. Investing in Core Labs is all about your time horizon. If you are looking for a quick gain from an industry recovery, then chances are you will have to hang on much longer than originally anticipated. For those that plan on holding onto shares for a long time, then this news isn't too much to worry about. A couple more quarters of flat to slightly declining profitability isn't going to seriously compromise the prospects of this business. Beyond that, Core's work on helping to optimize the production rates and longevity of oil and gas reservoirs is going to remain a valuable tool for producers that want to get the best economics possible. As long as that remains the case, then Core Labs will continue to be a valuable stock.